Dismissed from the U.S. 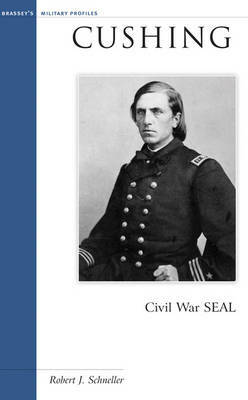 Naval Academy in early 1861, William Barker Cushing nonetheless emerged from the Civil War as one of the Navy's greatest heroes. Cushing transformed his reputation from a rabblerouser into a living legend, because he embodied the special qualities that the Navy demands of the men in whom it entrusts its most hazardous and secret tasks: a readiness to volunteer for dangerous assignments, an unflagging devotion to duty, and more than a fair share of good fortune. As Robert J. Schneller observes, "He was patriotic, aggressive, tough, and recklessly bold." Before embarking on his most daring mission-his celebrated destruction of the Confederate ironclad Albemarle-he bragged that he would "come out victorious or `toes up.'" By the end of the war he had amassed four commendations from the Navy Department and the thanks of Congress and President Lincoln. "All this for a man," Schneller writes, "who was only twenty-two years old when Lee surrendered at Appomattox." Employing his customary readable and entertaining style, Schneller focuses on Cushing's naval career and those aspects of his personality that affected it.